Excess mucus can restrict transportation along the many pathways of the body, creating a feeding ground for viruses and pathogens. Diet is the biggest factor to either clog or boost your immune system. I suggest you read the following tips, print the ones that really shout out to you, and hang them up on your fridge door. Diabetes, high blood pressure, breast cancer, Alzheimer’s, arthritis, stroke, mental illness, chronic fatigue, asthma, prostate cancer, cirrhosis of the liver. The universe is beginning to look more like a great thought than a Great Machine. The universe is alive with movement: moons rotating around planets, planets orbiting stars, gaseous rings rotating and expanding, meteors and comets soaring through space at great speeds; and all the while the entire universe is expanding at an accelerated rate. Thankfully for us, it is not a dance of chaos, gravity governs the dance, allowing stars, planets and moons to move coherently to one another. In like manner, there is a vast micro-universe softly humming underneath our skin. As with the seemingly endless varieties of stars, human cells vary in shape and function and there are trillions of them in your body. They carry out the continual demands of the body’s life processes in elegant harmony. 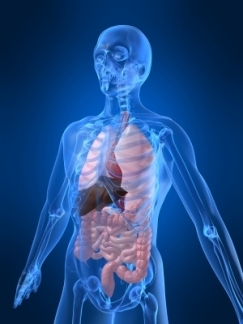 The digestive system is just one example of the body’s remarkable ability to assimilate the raw materials from its environment to manufacture all the necessary elements for physiological function. Through digestion, the food you eat every day is broken down into molecules small enough to squeeze through the billions of blood capillaries imbedded in your intestinal wall. The bloodstream circulates these molecules until they enter the intercellular fluid that surrounds the cells. Finally these molecules pass through the cell membranes into the cells. It is here we find a direct connection between what you eat and the health of trillions of cells that make up the human body. Look at the tiny human cell. The cell membrane is a thin, flexible, living material, serving as a gateway, allowing chemicals to flow in and out. How it is able to do this is not fully understood. Molecules found on the inside of the membrane act as enzymes which accelerate chemical reactions within. In contrast, the molecules that are on the outside of the membrane act as receptor sites and can join with specific chemicals produced by other cells. When viewed through a standard laboratory microscope, the cytoplasm within the cell could be mistaken for a clear liquid with little specks sprinkled throughout. But when examined more closely through an electron microscope, a whole world is revealed, filled with networks of membranes. This is where most of the activities of the cell occur; it is here that the Big Mac, fries and Coke are received and processed. All this complexity increases tenfold when we attempt to understand how cells communicate and work together. It was as if a Creator wanted to ensure that we could not get it wrong. As we increase in knowledge, there can be only one answer to the question, where did all this come from? From the choreographed dance of the universe to the complex interchange of human cells, all point to an engineered design. The Know-It-All Health Nut is available for sale! Click here to find out more.